Mt. 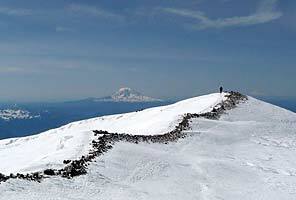 Rainier, at 14,410 feet, is one of the largest and most challenging endurance climbs in the United States. It is the most imposing glaciated peak in the lower 48 States and has long been a premier training ground for climbs such as Denali, Aconcagua and the Himalayas. An attempt of Mt. 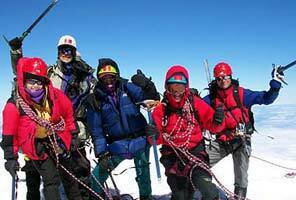 Rainier is a serious endeavor and one that demands good physical fitness. It is our goal to help you properly prepare for your upcoming Mt. Rainier climb. 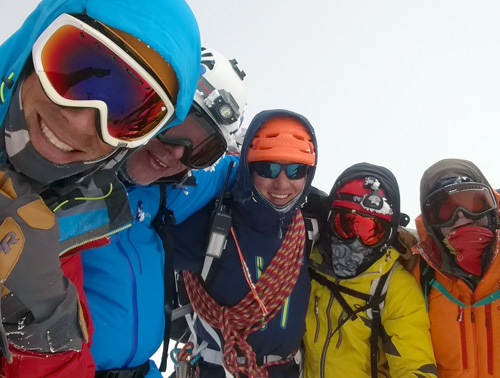 We realize that many of our customers have never climbed a large mountain before and are unsure about exactly how to train for a climb of such magnitude. 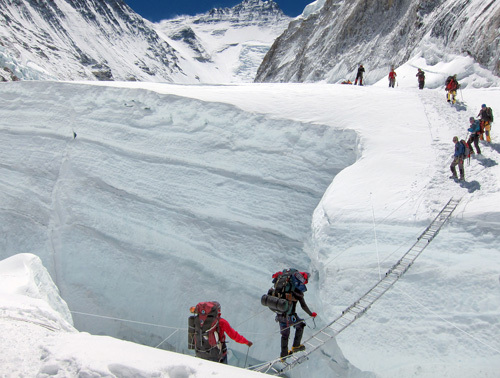 We will try to help by explaining as clearly as possible what will be expected of you physically during your ascent. We have also done our best to outline how to achieve the necessary fitness level. You will be safer, increase your chance of success and enjoy the climb more if you show up in good physical condition. Climbing Mt. Rainier is not an easy endeavor no matter how fit you are. In general, you will want to arrive in the best shape of your life. More specifically, each individual day on Rainier will consist of at least five hours of steady climbing per day at altitude, with a rate of ascent close to 1000 ft/hour and at least 40 lbs on your back. Summit day will likely be twice that amount of time with less weight. 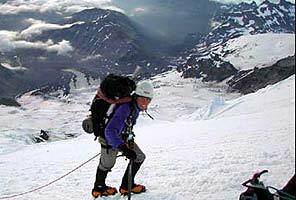 The best training for a Rainier climb includes hiking up and down hills carrying weight for multiple hours at a time. Your endurance will be significantly better if you can work in two-day (or more) hikes to your training program to get used to working hard for multiple days in a row. If you don't have the ability to hike outdoors, be sure to incorporate sessions on Stairmaster-type equipment or hiking/running stadium stairs for extended periods into your routine. Cross training by running, bicycling, ski touring, swimming, and lifting weight is also a good strategy. No matter what you do to achieve your fitness goals, take a serious approach to training, and make a training plan part of your daily routine. We recommend starting a training plan at least several months before your departure date. If you outline your specific goals in advance you are much more likely to stick to them. Record your workouts each day to help track your progress and keep you on the right course. As always, consult with your family physician before starting any new training program. To create a training plan simply write down what you propose to do each day on a calendar for the months leading up to your Rainier climb. Follow the guidelines listed below. It is important to start slowly and work gradually up to higher levels of fitness. Begin with shorter workouts, low weight and lower intensity and gradually increase all of these as you start to feel stronger. Your training plan can help structure this. Listen to your body, and only increase by an amount you feel comfortable with. Don't rush it. If you have started far enough in advance you should have plenty of time to work up to your set goals. Your training plan should consist mostly of cardiovascular, or endurance training that keeps your heart rate moderately high (60-80% of your maximum) for extended periods of time. Examples of cardio training are hiking, biking, running and swimming. You should be cardio training at least three times a week for 40 minutes or more, with another longer workout of 2 hours or more once a week. This will be the core of your training and must be above and beyond anything else you are doing. For instance, if you are spending 2 hours a week in the gym lifting free weights, you still need to complete at least the recommended amount of cardio training on top of this. The cardiovascular training will help you the most on the climb and should not be substituted. Make sure you ease into each training session with 5 to 10 minutes of warm-up and stretching. Cooling down is important as well, be sure to taper off gradually as your session comes to a close. Hiking: The best endurance training is hiking up and down hills. This exercises the exact muscles you will use on the climb. We recommend starting without weight at first and adding weight to a backpack gradually. Eventually you should be able to hike for several hours at a time with 40 lbs on your back. Incorporate at least one multi-day hike with weight into your training before the climb if possible. Focus on keeping a steady, even pace. Stairmaster or stadium steps: If there isn't a way for you to hike, the best alternative is to spend time on a Stairmaster-type machine or hike laps on the stairs at a stadium or high-rise building. Again, this will work the muscles you'll be using on the climb and allow you to get used to carrying weight. Doing stadium steps forces you to go up and down, working your descending leg muscle groups as well. A Stairmaster doesn't. Because of this, it is not ideal to work out solely on a Stairmaster. Running: Running is excellent cardio cross training. It's a great workout and does a good job of building general strength in your legs. However, it's not practical to run with weight on your back, and it is hard to run for extended periods of time. If possible, running should be supplemented with vigorous uphill hiking. Ski Touring, Bicycling, Swimming, etc. : These are all excellent forms of cardio cross training, and can be incorporated into a very successful training plan. They all have their limitations, however, as they are less effective at preparing you for the climb than hiking. If you use these mediums for training, use your judgment and make sure you are getting a solid workout. Weight training and strength training can be an effective part of a training plan as well. They are excellent ways to build general strength. People sometimes substitute them for cardiovascular training, however, with less than ideal results. Make sure to continue your cardio training throughout, weight training is extra. We recommend strength/weight training 2 to 3 times a week if possible, focusing on the legs and core strength. This can be done at home, in the park, or in a gym. It is very important to warm up and cool down before and after weight training, combined with stretching to prevent injury. A personal trainer can help you iron out a climbing specific plan. Make sure you do at least three sets of 12 to 20 repetitions for each exercise. Remember, climbing Mt. Rainier is an endurance sport. You don't want to build a lot of muscle bulk with low reps and high weight. Whatever cardiovascular training activities you decide upon, do them at least three days a week for 40 minutes per session, with a longer two-hour workout on the weekend. This is really the minimum. It is hard to over-train for a Rainier climb. Be careful in the final few weeks leading up to your climb not to injure yourself by pushing too hard. Begin easing off a bit towards the end. The last thing you want is an injury just prior to the climb that forces you to miss the entire experience. Pay attention to your body, push your training when you can and rest when you need to. It is important to do your homework before you climb so you have a safe, successful, and enjoyable climbing experience. If you have any questions please feel free to contact us. There is no better way to get in shape than with a goal to aim for, and climbing Mt. Rainier may be the biggest goal you'll ever have! Good luck. If this didn't hurt so much, I'd be having fun! Just wanted to drop you all a line and tell you how much I enjoyed my trip with you. Everything was great including the weather. Your company is first class in all respects. I knew exactly what I needed to bring and rent. All of your staff that I met was friendly, helpful, knowledgeable, and I felt safe with them. The rental equipment was also high quality. The overall experience was fantastic. 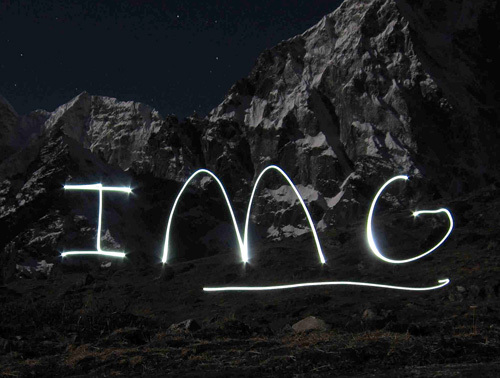 If I am able to go on another mountaineering trip, it will definitely be with IMG.